It is no secret that most children have an insatiable urge to grab the dirtiest looking things and put them into their mouth. Even a child who is less than a year old is hardly able to do much except drink milk and sleep all day, experiences a personality change the moment it is put down on the ground, out in the open. The exploration begins and everything including dirt, mud and even poop finds its way into the tiny mouths. This continues for a while and most mothers are clueless about why their babies find the taste of dirt so irresistible, when mashed veggies, formula food in various flavors and other food prepared with the labor of love just do not seem to appeal to them! Well, relax everyone! You’re not bad cooks, bad parents or bad caregivers. Your darling kids are just being very natural and their actions are driven by instinct. Recent research suggests that children splattered in mud are acting on instinct that gives them an evolutionary advantage. The immune system that is still in the developmental stages in children, is exposed to a variety of bacteria, viruses and worms through all the dirt and filth. This exposure prepares suitable immune responses to counter the possible ill effects caused by the entry of these pathogens into the body. This early exposure to pathogens is so effective that scientific research claims it is instrumental in preventing allergies and other autoimmune disorders later in the life of these children. Exposure to dirt and filth is akin to a “warm-up” exercise for the immune system to enable it to get ready for nastier bugs. Isn’t that a good reason why dirt is good for kids? Among all the research published, the book by Dr. Mary Ruebush, Why Dirt Is Good: 5 Ways to Make Germs Your Friends is worth mentioning here. Through her book, the immunologist strongly advocates that the western civilization’s obsession with antibacterial soaps and the quest to be ‘always clean’ is actually making our children more sick. Diseases involving immune dysregulation, autoimmunity or chronic inflammation have been increasingly reported as becoming common in developed countries. Experts believe that this is mainly due to the destruction of our ‘personal ecosystems’ caused by our attempts to over sanitize our living spaces and our bodies to make them “germ-free”. A whole range of modern diseases such as multiple sclerosis, Crohn’s disease, Graves’ disease, ulcerative colitis, type I diabetes, asthma, allergy, coeliac disease, and Sjögren’s syndrome are more common than ever before, and experts believe that our excessive sanitization of our environment is one of the primary causes. In modern medicine, this theory is called the hygiene hypothesis. The hypothesis states that humans have always coexisted with several varieties of microbes (lactobacilli, various mycobacteria, and certain helminths) including parasites forming our personal ecosystem. The exposure has resulted in human beings becoming less susceptible to allergies. But in today’s extremely clean environment, the lack of exposure to these microbes has resulted in children growing up with an underdeveloped immune system. The lazy immune systems are now developing allergic reactions instead of focusing on fighting infection (which never occurs due lack of exposure to microbes, thanks to vaccination, hand washes, airtight windows, etc.). In addition, antibiotics are making things easier for the already relaxed state of our immune system. On the contrary, the microbes are now fighting back to resist these artificial responses, resulting in “super bugs” that seem to be resistant to even antibiotic treatment. Is it Time to Shed our Clean Image? So should we go to the prehistoric lifestyle of humans and stop all vaccinations and cover our children in filth and dirt? Should we just stop bothering if the child catches a mild cold or fever, hoping his/her immune system will rise up to the challenge? Certainly not! We definitely should not ignore life-threatening food allergies or encourage our children to be less hygienic in the hope of developing resistance to germs. What we need to do is stop obsessing over cleanliness and understand why playing in the dirt is good for kids. Let your kid play freely when he/she is out in the open. Let environmental interactions be normal and playful. 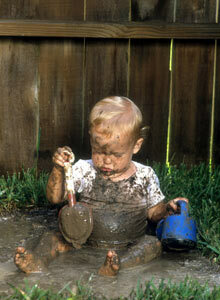 Stop fretting every time your child touches mud on the ground. Do not count the several times he/she touches his/her sweaty playmate! It is useless to lose sleep over that little scratch on his/her elbow. Stop carrying the hand sanitizer looking for an opportunity to use it on your child. Go and get that vaccination done now, if your child has been bruised by a rusted metal thing. Ask your child to wash his/her hands before a meal and to always keep the nails clean. Ordinary soap is fine for maintaining hygiene. Avoid using antibacterial soaps on a regular basis. A balanced diet and normal exposure to the environment are essential for children. You’re not being a protective parent by obsessing over your child’s hygiene when outdoors. Just let the child be. Find that essential balance between caution and obsession. 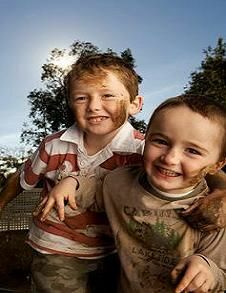 Let your children go barefoot into the mud and befriend some of those germs! Mother Earth will surely protect them. This entry was posted on 24/03/2012 at 21:35 and is filed under Environment, Health, Holistic Living. You can follow any responses to this entry through the RSS 2.0 feed. You can leave a response, or trackback from your own site.